West of England organisations that support fair trade have been praised by TV personality Nick Hewer for “putting their money where their mouth is” at the region’s recent Fair Trade Business Awards. Countdown presenter Mr Hewer, a long-running supporter of ethical business and a patron of The Fairtrade Foundation, said these organisations should be celebrated for “using their business as a force for good”. Mr Hewer, who was also Sir Alan Sugar’s former right-hand man on The Apprentice, presented the awards, which are now in their seventh year and recognise organisations of all sizes across the region that sell or buy Fair Trade-certified products and that promote Fair Trade campaigns and values through their communications. Among the winners were the University of Bath, which scooped the Best South West Fair Trade University or College title, and Frome-based fruit drink producers Natural Beverage Company, which landed the Best Fair & Local Product award for its Fruit Hit 200ml cartons. Other winners included Bristol-based Cotton Smiles, which imports bags, aprons and tea towels made in India from 100% Fairtrade-certified organic cotton, Bristol’s Create Centre, Bristol-headquartered law firm Lyons Davidson, Hampshire-based ethical school clothing supplier Koolskools, Full of Beans café at UWE Bristol, and Katie Hodkinson – founder of ethical textile businesses Fairly Beautiful and Eco Bee Wrap – who was recognised for her advocacy of Fair Trade. The Best South West Fair Trade Business Award went to design and print agency Minuteman Press Bristol, which was recognised by judges for its “incredible commitment” to Fair Trade, including a bi-annual Fair Trade review meeting and an audit of all their purchasing to incorporate Fair Trade lines wherever available. 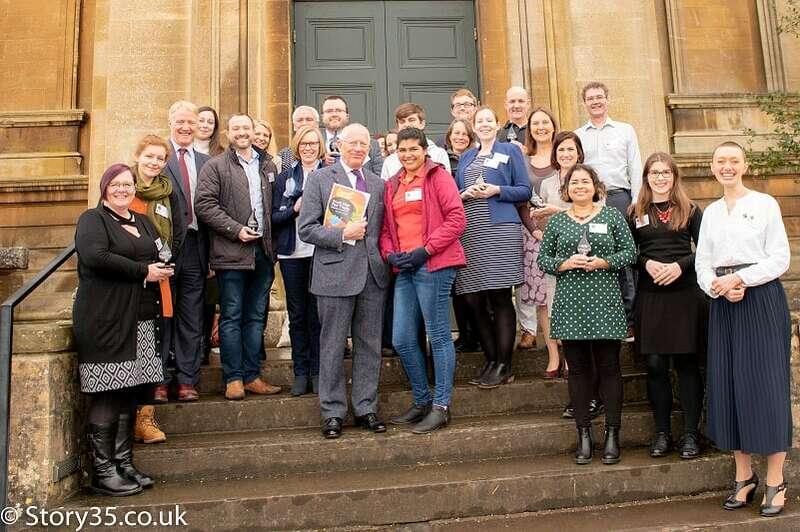 Fifty applicants were celebrated at the awards ceremony, held at Bristol’s Arnos Vale Cemetery, for their dedicated support of Fair Trade through their business, each leaving with bronze, silver and gold certificates, plus specially commissioned Bristol Blue Glass trophies for the category winners. As well as host Nick Hewer’s rousing speech, attendees heard from the Fairtrade Foundation’s head of supply chain management LJ Loftus, and from coffee and cocoa producer Junieth Leiva, who was visiting the UK from Nicaragua to advocate for Fairtrade. The awards were sponsored by ethically-minded businesses Bristol-headquartered national law firm Burges Salmon, Wogan Coffee, Indigo Valley coffee roasters and Ecoffins – whose Fair Trade certified eco-friendly coffins were an apt fit for the ceremony’s location. Destination Bristol and South Gloucestershire Council supported the planning of the event, which is spearheaded each year by Bristol Fair Trade Network. The ceremony is the flagship event for Fairtrade Fortnight in Bristol. The two-week celebration of Fairtrade, led by Fairtrade Foundation, this year launched a new campaign calling on people to urge the government and companies to ensure that cocoa farmers in West Africa are paid a living wage. Currently, farmers – often women – are paid less than 75p a day, less than half the amount needed for a decent standard of life.